Over the years I have either read about or encountered those who are commonly referred to as "King James only" people. These Christians and/or churches refuse to read anything other than the King James Bible and consider all other translations to be inferior. On some occasions, when asked by members of this group, I have offered some reasons why the King James Bible is not the "only reliable" Bible. While it was a fine translation in its day and is the ancestor to the NAS and NRSV, it has simply gone beyond its shelf life. We have better translations based on better manuscript evidence. Of course many don't agree with my explanations and try to counter my arguments with statements about Textus Receptus, which I am pretty sure they think is some type of dinosaur. But the following seven reasons offered as to why the King James Bible is better than the originals is new to me. The logic is, well . . .
Like James Mcgrath, who pointed this out to me, I thought this was a joke. But it seems to be very serious. Not much better is the other list which explains why the KJB is better than other translations. I guess I hadn't realize the importance of having Lucifer's name in the Bible. And thank goodness the KJB has some extra verses that are missing in other translations and, I might add, are missing from the originals as well. For those of you who attend SBL/AAR every year and love beer, I think John Anthony Dunne and Chris Brewer have an excellent idea. .
An informal reception for members of SBL/AAR looking to re-connect with old friends, and meet new ones, while sharing craft beers from around the world. DescriptionThe best part of SBL/AAR is that they're an opportunity to re-connect with old friends and meet new ones. And there's no shortage of receptions, and plenty to drink, but seriously, is Heineken the best we can do? Because we believe that every square inch includes every last drop we've decided to host an informal gathering of SBL/AAR attendees where folks can drink and share their favorite craft beers. Here's the deal: Bring a 6-pack of craft beer to share from home. Maybe it's a regional brewery, something that's tough to get your hands on or a seasonal release. The idea is that we all get to try some stuff we might not otherwise get to try. Spread the word, and bring some good stuff to share. On a side note, if any of you have an academic interest in alcohol in the Bible, the broader ancient world, or theology, we'd also like to include a few other short talks (approx. 10 minutes), so send an brief abstract of 100 words to jad22@st-andrews.ac.uk and cb235@st-andrews.ac.uk. I am in! I wonder if they would mine if I brought some home brew? Be sure to like their page Society for Beer Lovers & Assorted Academic Research on Facebook pass the word. Are Stories of Christian Persecution a Myth? I remember the first time I heard the story of Polycarp, an early Christian martyr. According to the legend, this bishop of Smyrna was executed for his faith. Having been tried and found to be a Christian he was tied to a stake and set on fire. However, the flames didn't burn him and instead of smelling burning flesh the crowd smelled what seemed like baking bread. Frustrated, the executioner stabbed Polycarp and the flow of blood from his dying body extinguished the flames. It wasn't long after that I was introduced to martyr stories through the works of Eusebius the church historian and Foxe's Book of Martyrs. It seems that many died while proclaiming their love for God and the Church. But did they? Are these stories true or are they myths based perhaps on real events or are they completely fabricated stories. In her new book The Myth of Persecution: How Early Christians Invented a Story of Martyrdom (Harper Collins, 2013), Candida Moss examines the martyrdom genre. Here's the blurb. 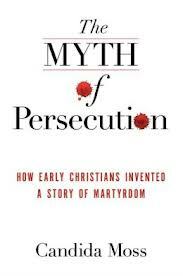 In The Myth of Persecution, Candida Moss, a leading expert on early Christianity, reveals how the early church exaggerated, invented, and forged stories of Christian martyrs and how the dangerous legacy of a martyrdom complex is employed today to silence dissent and galvanize a new generation of culture warriors. According to cherished church tradition and popular belief, before the Emperor Constantine made Christianity legal in the fourth century, early Christians were systematically persecuted by a brutal Roman Empire intent on their destruction. As the story goes, vast numbers of believers were thrown to the lions, tortured, or burned alive because they refused to renounce Christ. These saints, Christianity’s inspirational heroes, are still venerated today. Moss, however, exposes that the “Age of Martyrs” is a fiction—there was no sustained 300-year-long effort by the Romans to persecute Christians. Instead, these stories were pious exaggerations; highly stylized rewritings of Jewish, Greek, and Roman noble death traditions; and even forgeries designed to marginalize heretics, inspire the faithful, and fund churches. The traditional story of persecution is still taught in Sunday school classes, celebrated in sermons, and employed by church leaders, politicians, and media pundits who insist that Christians were—and always will be—persecuted by a hostile, secular world. Moss urges modern Christians to abandon the conspiratorial assumption that the world is out to get Christians and, rather, embrace the consolation, moral instruction, and spiritual guidance that these martyrdom stories provide. The Roman evidence is also ambiguous. If Nero did target Christians after the great fire of Rome in 64 C.E. -- and the are good reasons for thinking he did not -- his treatment of them stemmed less from a desire to harm Christians than it did from his need to deflect blame from himself. Ancient Romans who spread the story about Nero saw his actions as contemptible and unjust. Clearly this is going to be a provocative book that will bring both heat and light to the discussion. I look forward to reading it to see what she has to say. I imagine there will be some who react, but I suspect that there will be much that Moss will shed light on that will help us to evaluate the history of Christianity. Are we witnessing the end of the book as we know it? Mark Twain once quipped "the reports of my death are greatly exaggerated." And like Twain, there have been other death rumors in history that have proven to be incorrect. There will always be someone trying to drive the last nail in the coffin too soon. But what about books and the publishing industry? How much longer will they last? Newspapers and magazines are shrinking and/or disappearing. 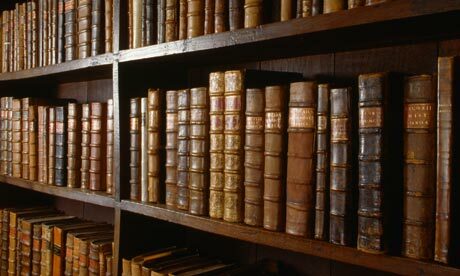 Books are still being published, but they are under threat. The debut of the eReader has thrown a wrench into the works in a way that no one anticipated. I admit that when my wife gave me a Kindle for my birthday I was skeptical. I wasn't sure I was all that interested. Now I love it. I am still buying books the "old fashioned way." I am not prepared to have all of my reference books on a tablet. I don't find it all that easy to use (yet) and I still like the way books look on my shelf. But I can foresee day in the not too distant future when the shift will happen. And then those who make bookshelves, bookmarks and book covers will be relegated to history along with blacksmiths, wheelwrights and cassette tape players. Wired.com has an interesting article on the way publishers are scrambling to get ahead of the curve. I found this bit interesting. After centuries in which books and the process of publishing them barely changed, the digital revolution has thrown the entire business up for grabs. It’s a transformation that began with the rise of Amazon as an online bookseller and accelerated with the resulting decline of the physical bookstore. But with the shift to ebooks—which now represent upwards of 20 percent of big publishers’ revenue, up from 1 percent in 2008—every aspect of the existing framework is now open to debate: how much books will cost, how long they’ll be, whether they’ll be edited, who will publish them, and whether authors will continue to be paid in advance to write them. It’s a future that Amazon doesn't control and one where traditional publishers might eventually thrive, not just survive. The only certainty is that the venerable book business, a settled landscape for so long, is now open territory for anyone to claim. It will be interesting to see what happens. On the one hand, the eBook can be produced more cheaply, is better for the environment and will allow more people to publish their work. On the other hand, it may allow even more rubbish to appear. That last comment is not based on rumor or speculation but a quick perusal of the top selling books on my Kindle. What do you think? 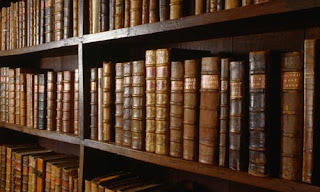 Will we ever completely jettison the book as we know it?